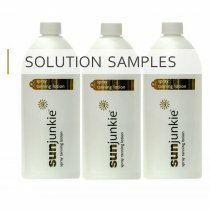 I am the Sunjunkie Duo Spray Tan Solution. I am proud to be the Official Professional’s choice for spray tanning solutions. I have a reputation for creating a perfect and natural looking tan… I’ll leave you and your clients feeling perfectly tanned! With my unique formula blended with the finest natural tanning agents and skin penetrating moisturizing ingredients, I will give you a deeper, richer, and more natural looking spray tan. I contain Aloe Vera and Vitamin E infused to create a super fine mist and the perfect spray tan solution. How Long Do I Last? I develop within 4-8 hours and I will last on your skin for 7-10 days, and fade evenly with no streaks… You won’t even know I’m there! 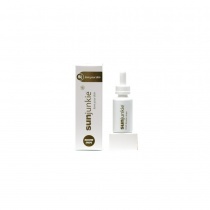 I am a unique mixture of plummy and olive undertones, never before seen in any other spray tanning solution. I am available in many different shades to suit every skin tone – See my colour guide below! Aloe Vera, Vitamin E infused to create a super fine mist and the perfect spray tan solution.